Performance of fourier domain vs. time domain optical coherence tomography. In this article we present a detailed discussion of noise sources in Fourier Domain Optical Coherence Tomography (FDOCT) setups. The performance of FDOCT with charge coupled device (CCD) cameras is compared to current standard time domain OCT systems. We describe how to measure sensitivity in the case of FDOCT and confirm the theoretically obtained values. It is shown that FDOCT systems have a large sensitivity advantage and allow for sensitivities well above 80dB, even in situations with low light levels and high speed detection. Sensitivity advantage of swept source and Fourier domain optical coherence tomography. We present theoretical and experimental results which demonstrate the superior sensitivity of swept source (SS) and Fourier domain (FD) optical coherence tomography (OCT) techniques over the conventional time domain (TD) approach. We show that SS- and FD-OCT have equivalent expressions for system signal-to-noise ratio which result in a typical sensitivity advantage of 20-30dB over TD-OCT. Experimental verification is provided using two novel spectral discrimination (SD) OCT systems: a differential fiber-based 800nm FD-OCT system which employs deep-well photodiode arrays, and a differential 1300nm SS-OCT system based on a swept laser with an 87nm tuning range. This is an open-access article distributed under the terms of the Creative Commons Attribution-Noncommercial-No Derivative Works 3.0 Unported License, which permits download and redistribution, provided that the original work is properly cited. This license restricts the article from being modified or used commercially. 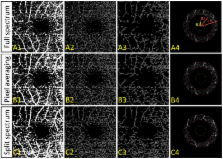 Monte Carlo modeling of angiographic optical coherence tomography. High-resolution handheld rigid endomicroscope based on full-field optical coherence tomography.